Rangers' rookie Lauri Korpikoski witnessed the Sean Avery Show firsthand for the first time Thursday night as he centered the third line that included the talkative winger on the left and Ryan Callahan on the right. Korpikoski said playing with Avery was fun -- and quite interesting. "It might be somebody's game plan to try to make him take penalties but he's smart enough not to retaliate and take penalties," Korpikoski told NHL.com. "He's probably been like that all of his career. Guys go after him and he knows it. They yapped and tried to draw him to take penalties, but it's good composure by him. I think he played a good, smart game." With Avery expected to be a target, Korpikoski said he and Callahan should benefit. "It might open up space for me and Cally," the Finnish forward said. "That's part of what he does well. He creates room for other players." UNIONDALE, N.Y. -- If it were any other player on any other team, there's no way the mini-altercation that took place in front of the New York Islanders' bench late in the first period Thursday night would have garnered much attention at all. 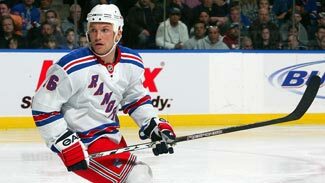 Since it was Sean Avery and he was wearing a New York Rangers uniform, it became a hot-button topic for the rest of the game and into the postgame. Nobody seems to care that Avery was just a third-line, energy winger for the Rangers in his first NHL game since Nov. 30. The Grate One, arguably the most hated man in hockey but maybe the most beloved Ranger this side of Henrik Lundqvist, is back on the big stage -- and Big Apple hockey fans are paying attention. So, too, were the Islanders, who were targeting No. 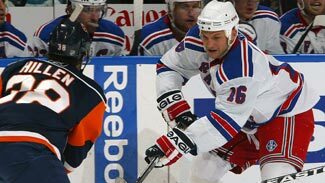 16 throughout the Rangers' 4-2 victory at Nassau Coliseum. "It's certainly good to get (the first game) out of the way and if there were any nerves coming in, I certainly got rid of them quick," Avery said in front of a large gathering of media after the game. "It felt great to be playing for this team again and obviously getting the win. That's what I cam here to do, to try to win some games." Avery returned to the Rangers' lineup just two days after being claimed off of re-entry waivers from the Dallas Stars, who signed him to a four-year, $15.5 million contract in the summer but banished him after uncouth remarks he made in Calgary on Dec. 2. The unsolicited, on-camera comments aimed at Flames defenseman Dion Phaneuf -- the result of which was a six-game suspension from the NHL and League-mandated anger management counseling -- was the last straw in a failed relationship between Avery and the Stars, one that ended Dec. 2 after all of 23 games. According to one Islander veteran, Avery's comments and the way he has acted in the past have made him an even greater target this time around. "I think that's safe to say that," forward Dean McAmmond said. "Including myself, there were a lot of players that were not impressed with his actions. The whole League wasn't. I think hockey players pride themselves on being character guys. You battle between the whistles, battle against guys you know, your friends, and you might even end up trading punches with one of your buddies. But after the game is where you have to still show some character." His actions Thursday barely registered on the Avery pest-o-meter. He was on his best behavior for most of the night. After chastising Sean Avery as an analyst for TSN, new Rangers coach John Tortorella stressed again Thursday morning that he's 100 percent behind the agitating winger, ready to give him a chance to ingratiate himself into the team once again. "We always try to put Sean over there and the rest of the team over here. Well, here's the team and Sean is right in the middle of that team," Tortorella said, using hand gestures for emphasis. Later on in his morning session with the large gathering of media, including a reporter and cameraman from TSN, Tortorella said, "Sean is part of this hockey club and I am going to beat the drum there because I don't think it's fair to Sean, I really don't. We always try to single him out. I know there is circumstance, but he is going to be part of this team. That's the only way it's going to work. "In my conversations, and I have had two or three with him, I think he really wants to do well," Tortorella added. "I know he loves it in New York. I think he just wants to be part of this and show people that he is going to be a complete player, compete and play under a team concept." He didn't score a goal or help on one, but he played a hard 13:56 and was whistled for a cross-checking penalty in the third period as the Rangers improved to 51-23-13 with him in their lineup. Avery also dealt with constant attention from the Islanders. "When am I not," Avery said when asked if he was targeted more often Thursday than in the past. With less than a minute remaining in the first period, Blake Comeau laid a clean shoulder-to-shoulder hit on Avery near the Islanders bench, knocking No. 16 off his skates. Comeau came back with another shove before Rangers forward Nikolai Zherdev jumped in and linesman Jonny Murray pulled Avery out of the mix. "Maybe a little bit," Comeau said in response to a question about specifically targeting Avery on that shift. Clearly playing the agitator's role, the one on which Avery thrives, Comeau followed his hits by blowing two kisses at Avery. Avery never shoved back, threw a punch or even came close to making a fist. However, after the teams changed personnel, he came back at Comeau with his mouth. It's what he's become known for around the League. Avery leaned over the glass partition dividing the two benches and could be seen jabbering at Comeau with Kyle Okposo caught in the middle. "That's just hockey," Avery said. "He was just being himself, yapping to me on the bench," Comeau said. "You kind of expect that from him. That's the way he plays." Interestingly, Avery stationed himself on the opposite end of the Rangers' bench between shifts for the rest of the game. Maybe that's the "milder version of Sean Avery" he said we'd all see this time around. "He didn't get carried away," Rangers coach John Tortorella said. "He is going to talk. That is part of his personality and part of what happens in the game. I don't want him to lose that. We allowed him to play. He did a good job in just maintaining his discipline. That's a step in the right direction. He can't get involved in what people try to get him to do. Then he'll be a really good player for us." On this night, the best Ranger might have been Nikolai Zherdev, who scored a first-period goal and set up a goal by Scott Gomez early in the third. Chris Drury's second-period power-play goal broke a 1-1 tie, and Markus Naslund added an insurance goal with 6:36 left in regulation. Comeau scored early in the second period and rookie defenseman Jack Hillen had his first NHL goal in the third for the Isles, who are last in the overall standings. The Rangers helped their playoff hopes by winning consecutive games for the first time since Jan. 20-27. They snapped an 0-7-2 slide on the road, won for the fifth time in six meetings with the Islanders this season and moved into a three-way tie with Florida and Pittsburgh for the last three playoff spots in the East, three points ahead of Carolina and Buffalo. The most painful moment for Avery came 1:11 into the third period when Islanders forward Trent Hunter slammed him face-first into the neutral-zone glass. Hunter was wrangled by Rangers defenseman Marc Staal as Avery lay face down on the ice. Avery got up a few moments later and skated over to the fracas as it was breaking up, but he never got involved. Hunter was sent off for boarding. "It just so happened that when he got the puck he got hit more than the other guys," Comeau said. "That's just the way it played out." It figures to play out that way every game Avery plays from here on out, probably for the rest of his career. If he can deal with it, the Rangers might have gotten themselves a steal at half the price, one everybody can't stop talking about. "He is a really effective player if he concentrates on his play and does not get involved in any of the other stuff," Tortorella said. "He is going to have to deal with that and I think he is ready to. I think he understands the situation."